A lawyer commutes daily from his suburban home to his midtown office. The average time for a one-way trip is 24 minutes, with a standard deviation of 3.8 minutes. Assume the distribution of trips times to be normally distributed. Find the probability that 2 of the next 3 trips will take at least half(1/2) hour. 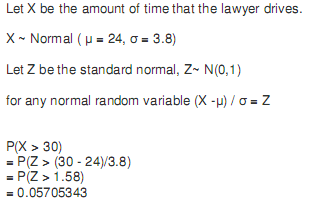 So, the probability that one of the trips takes more than 30 minutes is 0.05705343.